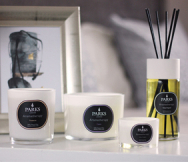 Bringing notes of soft wood, fresh citrus and rich bergamot to your home, Parks Silhouette is an iconic candle whose warm and uplifting fragrance has become one of the world’s most sought-after scents – and one whose success launched a thousand copies and imitations, none of which come close to the wonderful fine fragrance of our signature blend. Parks Silhouette is the result of painstaking craftsmanship by our skilled perfumers, who have lovingly combined a collection of cherished cherished natural extracts and ingredients to create this one-in-a-million fine fragrance. The scent is rich, warm and inviting, with uplifting notes of citrus, including fresh lemon and lime, which help to elevate and strengthen the bouquet – bringing powerful and invigorating scent to any room of your home. Underpinning our elegant and sophisticated Silhouette fragrance is a fine blend of bergamot and birch extract, each renowned for their rich and distinctive scent, as well as their sharp top notes of citrus. The unique, slightly camphoraceous scent of natural birch extract is particularly distinctive, bringing an intriguing and curious fragrance to your space that’s sure to provoke interest from guests. One of the original fragrances developed by our skilled perfumers, the Silhouette – Round Candle remains one of our best-selling scents, and one we’re proud to put our name to. The candle is made from pure, natural wax hand-poured into an elegant glass votive, with a soot-free wick that enables a clean burn – for up to 50 hours of irresistible fine fragrance.